Couldn’t help but post this photo taken last week at our September Book Club. This past month, we read and thoroughly enjoyed Madeline Miller’s novel “Circe,” which I’ve dubbed mythology for the #MeToo generation. (It was actually my pick. I’m a big mythology fan). Our Book Club started up in my former Boca Raton neighborhood, where we all lived at the time. In the sixteen years that have followed, we’ve gotten a tad older. (You didn’t notice? How sweet!). Several of us have moved out of the original neighborhood, and in fact, more than a few members have left Boca altogether. As Book Club members leave, others join (we try to keep the number of members at about a dozen). So while there some new faces among us, the core group is still there and going strong since Day One. Quite a few of us have gotten divorced. 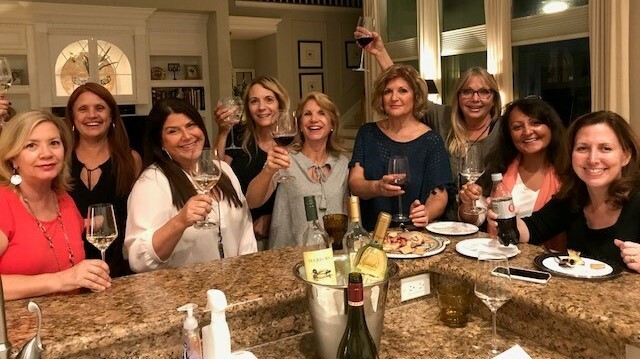 If you want proof of the rising phenomenon of “grey divorce,” or people divorcing in their 50’s, you don’t have to look much further than our book club. First there was one, then there were two, then there were three, and well, now there’s more. Our kids have grown up and we’ve watched many go on to college and make new lives for themselves far, far away. Some are now married and have kids of their own; still others are living at home and haven’t figured out yet what they want to do (of course, that’s true for some of us adults as well!). We’ve watched our own parents age and suffer from Alzheimer’s. We’ve shared our own real-life triumphs and tragedies, alongside the fictional stories we’ve shared through Book Club. It’s been good to share experiences with others; it’s always reassuring to know you’re not alone, and helps to get feedback and insights from others. Many of you know that working with women – single, married, divorced, widowed – is one of the cornerstones of our practice. What makes us so effective? We’ve been there. We’ve experienced the same problems and challenges as our clients. We hope our journey, and accumulated experiences, will help make your path just a little bit smoother.